Cueva del Castillo, Raúl Sanabria-Urbán, Salomón and Serrano-Meneses, Martín Alejandro 2015. Trade-offs in the evolution of bumblebee colony and body size: a comparative analysis. Ecology and Evolution, Vol. 5, Issue. 18, p. 3914.
de Oliveira, Mikail Olinda Cavalcante, Marcelo Casimiro and Freitas, Breno Magalhães 2015. 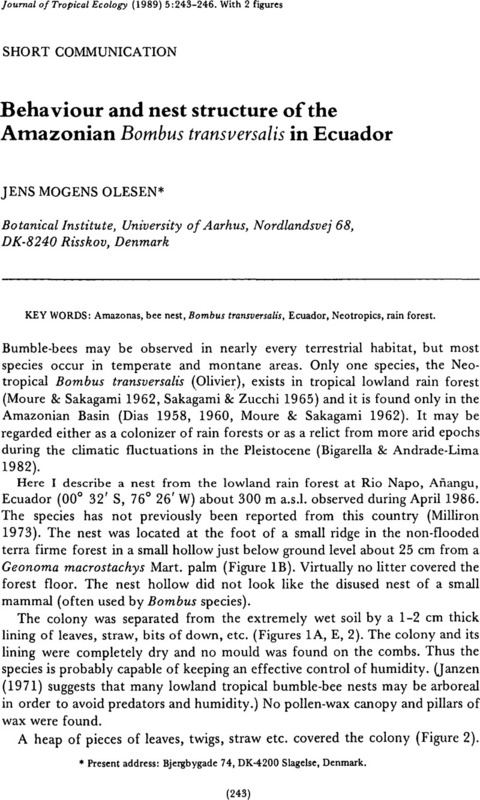 Nesting Behavior and Colony Description of the Neotropical Bombus (Thoracobombus) brevivillus in Northeastern Brazil. Journal of Insect Behavior, Vol. 28, Issue. 3, p. 297. CAMERON, S. A. HINES, H. M. and WILLIAMS, P. H. 2007. A comprehensive phylogeny of the bumble bees (Bombus). Biological Journal of the Linnean Society, Vol. 91, Issue. 1, p. 161. Hines, H. M. Cameron, S. A. and Deans, A. R. 2007. Nest Architecture and Foraging Behavior in Bombus Pullatus (Hymenoptera: Apidae), with Comparisons to Other Tropical Bumble Bees. Journal of the Kansas Entomological Society, Vol. 80, Issue. 1, p. 1. Cameron, S. A. and Whitfield, J. B. 1996. Use of walking trails by bees. Nature, Vol. 379, Issue. 6561, p. 125. Bigarella, J. J. & Andrade-Lima, D. De 1982. Paleoenvironmental changes in Brazil. Pp. 27–40 in Prance, G. T. (ed.). Biological diversification in the tropics. University of Columbia Press, New York. Dias, D. 1958. Contribuição para o conhecimento da bionomia de Bombus incarum Franklin da Amazônia (Hymenóptera: Bombidae). Revista Brasileira Entomologia 8:1–20. Dias, D. 1960. Nota sôbre urn ninho de Bombus construído acima do chão (Hymenopteraò Apoidea). Revista Brasileira Entomologia 9:151–156. Janzen, D. H. 1971. The ecological significance of an arboreal nest of Bombus pullatus. Journal of the Kansas Entomological Society 44:210–216. Michener, C. D. & La Berge, W. E. 1954. A large Bombus nest from Mexico. Psyche 61:63–67. Milliron, H. E. 1973. A monograph of the Western hemisphere bumblebees (Hymenoptera: Apidae; Bombinae). II. The genus Megabombus subgenus Megabombus. Memoirs of the Entomological Society of Canada 89:81–237. Moure, J. S. & Sakagami, S. F. 1962. As mamangabas sociais do Brasil (Bombus Latreille) (Hymenoptera, Apoidea). Studia Entom. 5:65–194. Olesen, J. M. 1979. Floral morphology and pollen flow in the heterostylous species Pulmonaria obscura Dumort (Boraginaceae). New Phytologist 82:757–767. Olesen, J. M. 1985. The Macronesian bird-flower element and its relation to bird and bee opportunists. Botanical Journal of the Linnean Society 91:395–414. Opler, P. A., Baker, H. G. & Frankie, G. W. 1975. Reproductive biology of some. Costa Rican Cordia species (Boraginaceae). Biotropica 7:234–247. Plowright, R. C. & Laverty, T. M. 1984. The ecology and sociobiology of bumblebees. Annual Review of Entomology 29:175–199. Sakagami, S. F. & Zucchi, R. 1965. Winterverhalten einer neotropischen Hummel, Bombus atratus, innerhalb des Beobachtungskastens. Ein Beitrag zur Biologie der Hummeln. Journal of the Faculty of Science, Hokkaido University (VI. Zoology) 15:712–762.